* Updated Kirki framework to the latest version. * Updated WooCommerce template files to the latest version. * Updated theme translation files. * Added author biography on|off feature for single posts. * Added slider text styling feature. * Update WooCommerce template files to the latest version. * Added WooCommerce cart icon (header area) disable feature. * Added custom header styling sub-menu links color feature. * Added custom header styling sub-menu links hover color feature. * Fixed bug where comments & comment form not appearing once comments are enabled for particular post/page. * Updated theme language (pot) file. * Added new page template (For Page Builders). * Added about author section on single.php. * Added logo width feature (Customize->Header->Logo). * Added header top bar styling features (Customize->Header->Top Bar). * Added header styling features (Customize->Header->General). * Updated theme language files. * Added jQuery custom head feature (Customize->General->Extra). * Added jQuery footer feature (Customize->General->Extra). * Added Fury Slider feature. * Updated WooCommerce cart total price via Ajax. * Fixed WooComemrce cart content cloned under account icon dropdown. * Fixed WooCommerce remove product from cart ajax issue. * Added WooCommerce product images lightbox/zoom swipe support. * Added product list widget css styling (WooCommerce). * Added top rated products css styling (WooCommerce). * Added filter products by price css styleing (WooCommerce). * Updated products in cart counter now uses Ajax (WooCommerce). * Updated remove product from cart now uses Ajax (WooCommerce). * Fixed WooCommerce full width loop layout when no sidebar. * Fixed WooCommerce product images lightbox/zoom issues. * Fixed WooCommerce checkout billing & shipping fields responsivity. * Removed "Colors" section from customizer. * Added "Styling" section into Customize -> General. * Added theme "Primary Color" in Customize -> General -> Styling. * Added "Off-Canvas" navigation wrapper background color feature (Customize -> Navigations -> Off-Canvas Navigation). * Added "Off-Canvas" navigation links color feature (Customize -> Navigations -> Off-Canvas Navigation). * Added "Off-Canvas" navigation links hover color feature (Customize -> Navigations -> Off-Canvas Navigation). * Added "Primary Navigation" links color feature (Customize -> Navigations -> Primary Navigation). * Added "Primary Navigation" links hover color feature (Customize -> Navigations -> Primary Navigation). * Added custom text option for "Read More" link in blog loop (Customize -> Blog -> Post Meta). * Added "Read More" blog loop link custom color feature (Customize -> Blog -> Post Meta). * Fixed - when sidebar is disabled and is front page, content width issue. * Fixed WooCommerce single product add to cart bug. * Fixed WooCommerce related product grid bug. * Fixed - when sidebar is disabled content width issue. * Minor translation strings escaping fixes. * Fixed 2nd sub-menu level not working on offcanvas & mobile menu. * Added theme .pot translation file. * Added Serbian translation files. * Added Full-Width template layout to page attributes. * Added enable or disable post titles (globally) feature (customizer). * Added enable or disable page titles (globally) feature (customizer). * Added enable or disable page meta (globally) feature (customizer). * Added YouTube social icon feature (customizer). * Fixed offcanvas menu & mobile menu - sub menus not working bug. * Fixed social share LinkedIn bug. * Added body background color feature. * Added header image feature. * Added theme action & filter hooks. * Added 2 more widget areas in footer (6 total). * Rewritten small parts of code. * Added bbPress plugin support. * Added select content layout type feature. * Added footer copyright feature. * Updated header search code. Are you looking for the perfect theme to build an online store ? 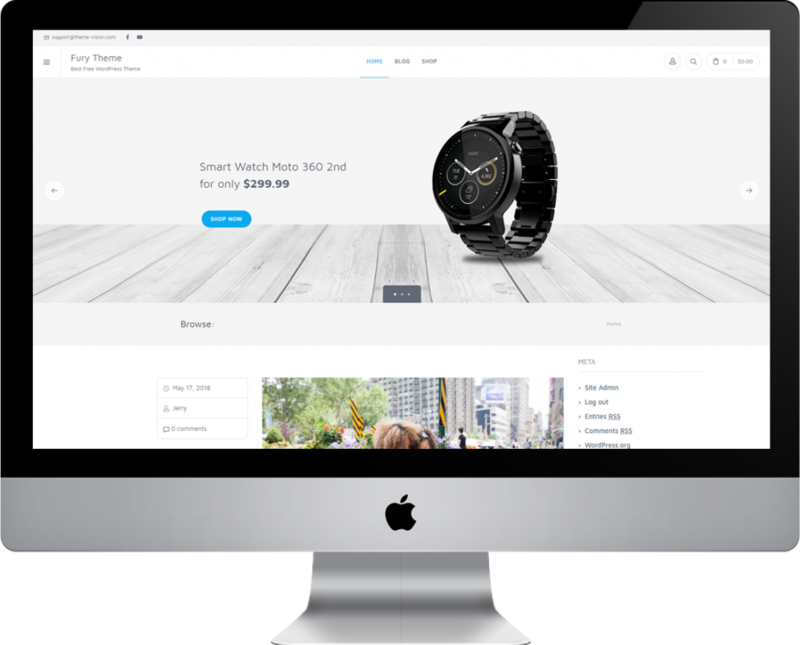 Fury is the lightweight and flexible WordPress theme that is intuitive and offers deeper integration with WooCommerce. With unique features and countless customizations you can build a store that matches your brand.